A Vernal man is facing charges including one count of 1st Degree Felony Aggravated Sexual Abuse of a Child. 31-year-old Jose Luis Solis is scheduled for a pretrial conference today in 8th District Court after having entered a plea of Not Guilty to that and six other charges for incidents that occurred in Vernal City including two counts of Child Abuse Involving Physical Injury that occurred in February, and four counts of Violation of a Protective Order that occurred last April. 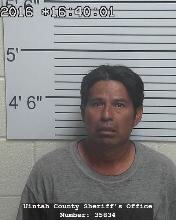 According to court documents, the alleged child sexual abuse offense occurred on or between July 4, 2008 and July 4, 2010 in Uintah County and Solis held a position of special trust with the victim. The document also states that the presumptive sentence for a conviction of the charge of Aggravated Sexual Abuse of a Child is 15 years to life in prison and imprisonment is mandatory.